Bulk email software for email marketing that will allow you to communicate with your customers and friends by creating and sending customized e-mails using your database and integrating with your web site mailing list. You can manage up to 15 customizable fields and thanks to the data merge functionalities, each recipients will receive a customized message: "Dear Mr. Smith..." instead of the unfriendly "Dear customer". Version 3.1.6 is a freeware program which does not have restrictions and it's free so it doesn't cost anything. For security reasons, you should also check out the Sendblaster download at LO4D.com which includes virus and malware tests. Additional screenshots of this application download may be available, too. 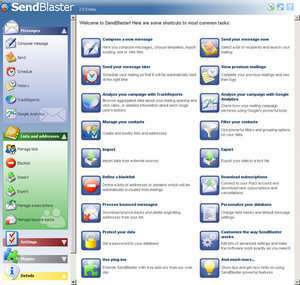 Sendblaster has a presence on social networks.